Is it too early to say “Happy Easter”? As Christians we know the end of the Holy Week story and so can be ready to rejoice, even as we commemorate the events of Good Friday. 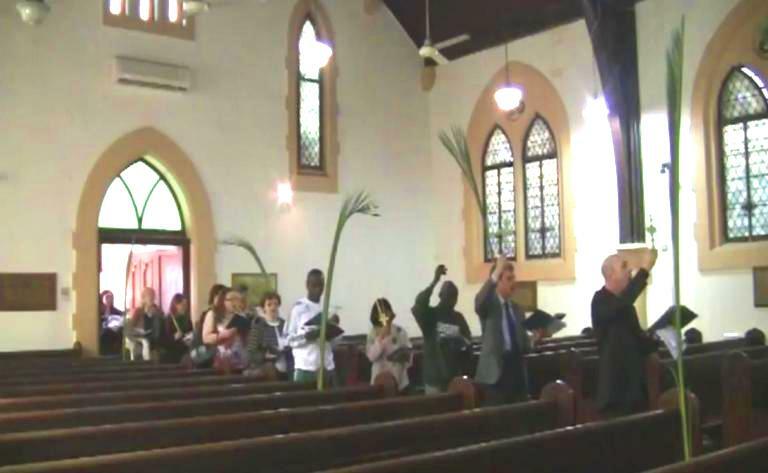 The picture above shows the beginning of our Palm ‘Sunday’ service last Friday, as we paraded into church singing ‘Ride on Ride on in Majesty’. The video of the service can be seen via the Media page. In Holy Week, the one celebrated as the conquering king at the beginning, becomes the criminal to be punished by the end. We will meet at 10am this Friday to remember Jesus the suffering servant, the one who died on the cross to take away our sins. On Sunday we will gather again to celebrate the risen Christ, the one who promises victory over death and the promise of eternal life. We are an Easter people! A people who have hope to share with the world – and not just the hope of future resurrection, but also hope for life on earth now! Please join us to celebrate if you can.